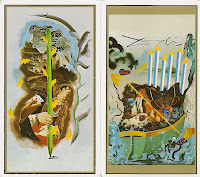 This deck was first published by Distribucions d’Art Surrealista and Comos Naipes of Spain in 1984. It consists of collage compositions which incorporate the works of other artists. Amanda Lear claimed to have assisted Dali in the completition of the collages. 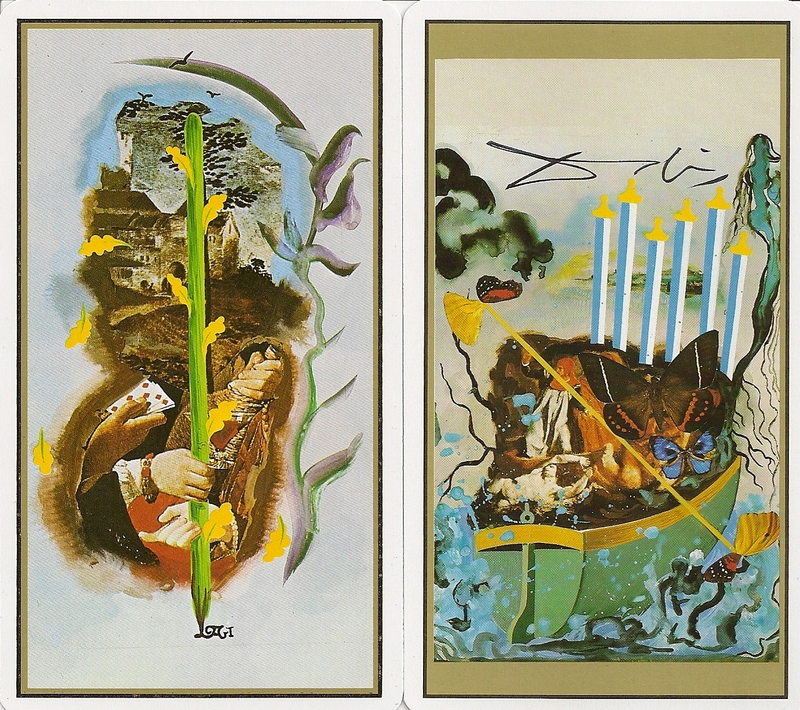 Dali adds his own touch to each design by using washes of color and semi-abstract shapes and adding his abstract signature onto the cards, incorporating them into each design. 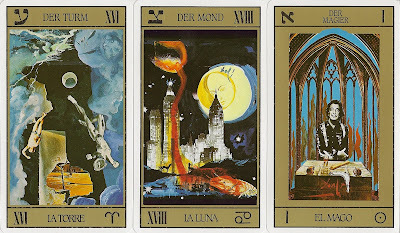 The Major Arcana bear German titles on top and Spanish titles below and are numbered I through XXI from the Magician to the World. Justice is numbered VIII and Strength is XI. 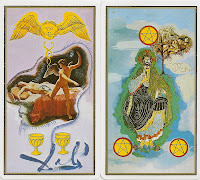 Hebrew letters are assigned to the cards starting with Aleph at the Magician through Resh at Judgment, and Tau is assigned to The World. 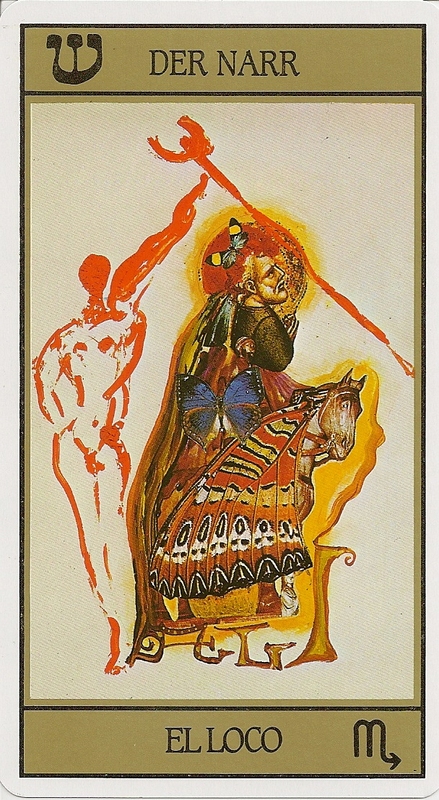 The Fool is unnumbered and has the Hebrew letter Shin. Planetary and Zodiacal associations are somewhat different from those usually found. The four suit emblems are painted into the designs. 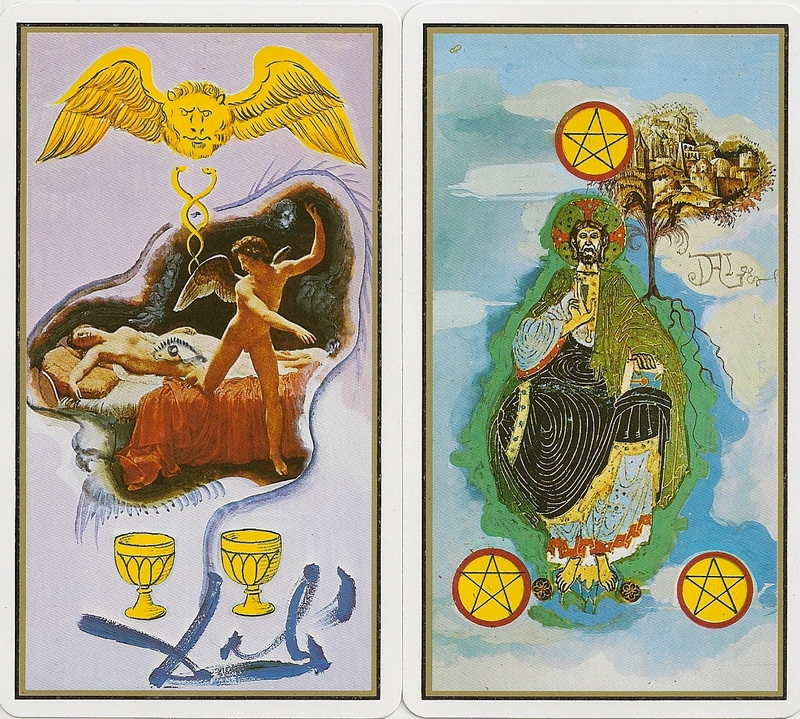 Wands are painted as green staves with small leafs, Swords are depicted as blue double-edged broadswords, Cups are painted as yellow lotus-patterned chalices and Coins are illustrated as flat disks of yellow with pentagrams. The Court Cards are titled in Spanish. The Suits Bastos, Copas, Espadas and Oros refer to Staffs, Cups, Swords and Discs, respectively. And the Court Cards Sota, Caballero, Reina and Rey are Page, Knight, Queen and King.